Daytime temperatures in January were reasonably mild although not as warm as 2018, the night time in contrast was colder with more frosts. It was a month with a sting in the tail as there was snow and this caused the inevitable disruption despite the relatively small amount. It was, yet again for this winter, a relatively dry month with only half the average rainfall even though there was some ”wet” on 17 of the days. There were many days of cloud when the sky seemed to be on top of us which is a bit depressing and such a contrast with a sunny day when the blue seems to go on forever. 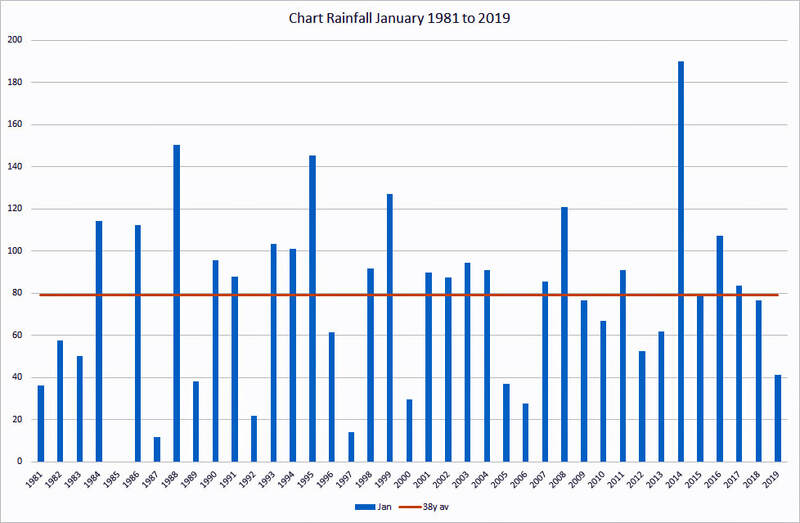 January does seem to go in for extremes; the difference between the wettest in 39 years at 190mm and the driest at 12mm is marked. The Met Office reported that this February was the warmest since their records began. Hyde Heath followed suite although we were unable to match the dizzy heights of 20° and above. 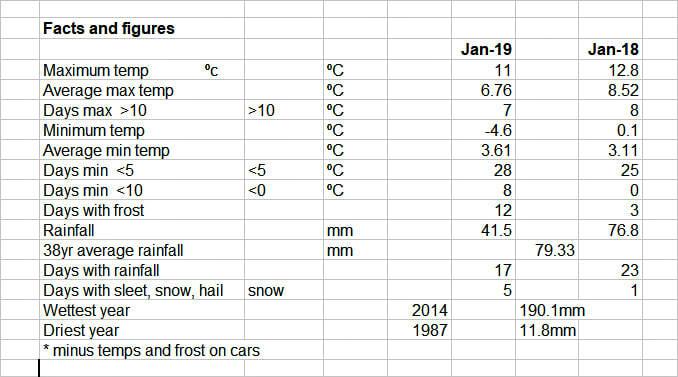 It is however not unusual for us to get carried away by the headlines; as recently as 2017 our temperatures in Hyde Heath were only marginally below what we saw this year. Compared with last year—the so called “beast from the east”—temperatures were considerably higher with a 6° increase in the maximum and a 4.8° increase in the average. I have include February 2017 for comparative purposes. ​Although the rainfall for the month was only a little below the 39 year average, it was a further month in this cycle of “fill dyke” where the water table will have been unaffected. The ground is still very dry and the Misbourne has hardly the sort of flow that one might hope for at this stage of the winter. The month started cold and wet (it did look as if the rainfall was going to make up for the dry months) but that all stopped after the 10th with very little rain and maximum temperatures steadily increasing. St David’s Day—1st March—marked the “official” Met Office start of Spring; I wonder what I will be reporting by the end of it?